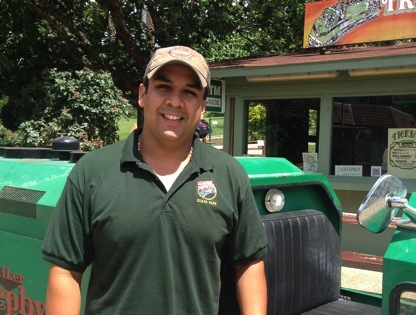 Jason Rodriguez was “born and raised in South Austin,” and he says it with that classic, laid back, South Austin pride. His family has owned and operated the concession stand near the Zephyr for over 35 years. They became silent partners of the Zilker Zephyr in 1995, when the current train was bought and new track was laid for the wider train, and in 2001, his father and grandfather became full owners. So Rodriguez grew up here. “I remember sleeping on the shelves [in the concession stand as a kid], taking a nap,” he recalls. When he was 13 years old, he started helping. Now he's manager. 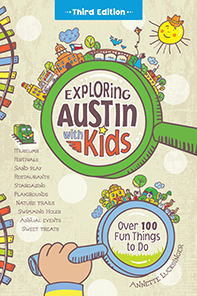 And despite the short route of the track that follows Barton Creek to Lady Bird Lake, riding just above the hike and bike to circle the Great Lawn at Zilker Park and double back, we have had countless adventures there. We have braved long lines to ride the train during the Kite Festival in March, hopped on after the Kite Festival to count the kites left behind in trees, rode in late November to watch the Trail of Lights go up, passed Woode Wood who pops up at a bend in the track to play his guitar and harmonica to a moving audience (with a built-in encore because the train doubles back to pass him on the way home), and joined train loads of kids on field trips in the spring. I asked Rodriguez his favorite season for the train and he said, “when it’s cooler!” In fact, one of the qualifications for a good conductor, he told me, is someone with a lot of energy who doesn’t mind being in the sun and outdoors. He mentioned “a fellow from New Hampshire who started working last year and the heat hit him hard.” But he enjoyed it so much, he’s here for another season. Whether intentionally or not, the conductors are responsible for maintaining many of the traditions that have sprung up with riding the Zilker Zephyr. When the train slows to pass under the bridge on Barton Springs Road, everyone looks to the water below to try to spot fish, ducks, and turtles. The conductors also honk as they pass under the bridge, at the turnaround point, and as the train slips under the bridge on the playground. Rodriguez mentioned that this was originally for safety reasons – and sometimes still is as joggers with headphones express surprise as the train appears alongside them – but people along the way hear the honk and see it as a signal to wave to everyone on the train. I asked Rodriguez if he ever rides anymore, and he grinned, “I’ve seen it.” But then he admitted that his daughters, ages 2 and 5, never grow tired of riding the rails and often talk him into it. 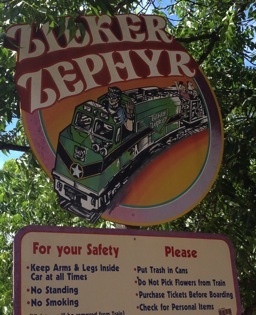 The Zilker Zephyr is located in Zilker Park between Barton Springs Pool and the playground. It’s open year-round (except when it rains and temps are under 50 degrees). Rides are on the hour on weekdays and every half-hour on weekends starting at 10 am. The last train leaves at 7 pm (and at 5 pm in winter).